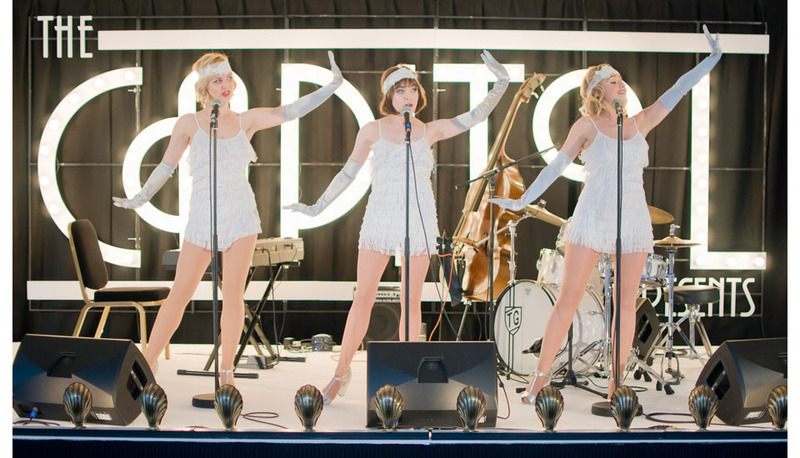 Flapper girls don’t get many mentions in the commercial property pages, but they were most certainly one of the highlights of the grand re-opening of a 1930s Art Deco-style cinema and theatre in Aberdeen. The red carpet was rolled out once again at the Capitol, in Union Street, for an impressive launch to celebrate the historic building’s transformation into 21st century office space. From gold leaf invitations to the black tie event to the authentic period features of the entrance foyer, from the mix of cool granite and marble to the handcrafted carpets and dark cherry wood timber, the once derelict property has been quite brilliantly restored behind its classic façade. With a black and white stage set for a live band playing music from the era, a troupe of flapper dancers, and glasses of fizz, you could easily forget the dark interim years when this luxurious theatre with its holophane lighting and valuable Compton organ was reduced to showing second-run films or rock concerts from Rod Stewart and the Rolling Stones. Only the front third of the former 2,000 seat venue has been retained as an entrance off the street and reception, though this does include a boutique stylish 26 person office with mezzanine in a former bar area. The main 70,000 sq ft of column free office space comes in a new build seven floor tower extension to the rear, for which critics will at first lambast local planners but then perhaps realise that bringing 700 more people to that part of a very tired looking Union Street could well be just what is needed in terms of regeneration. This is a £30m project by Knight Property Group and M&G Real Estate, with Andrew Cowie Construction as main contractor. Knight managing director James Barrack said: “At the heart of the Capitol redevelopment is a desire to bring new life to an iconic but derelict building. “Incorporating the old with the new, we have worked closely with project architects, Glasgow-based Keppie Design, to ensure the building seamlessly moves from the 1930s art deco front of house into column free Grade A office space at the back. “I don’t think we appreciated at the time the level of damage which had occurred over years of neglect. Despite the prevailing gloom in the oil and gas sector and a glut of commercial property, guests learned the Capitol had already been successful in recruiting its first blue chip occupier. Pricewaterhouse Coopers is to move its 120 strong North-east HQ from a traditional granite office in Albyn Place into the top floor, where vertigo inducing floor to ceiling glass delivers a magnificent view of the city skyline. The rental was not revealed, but The Herald understands this matched Aberdeen’s prime headline figure of £32 per sq ft.
With several levels of car parking and extending down to Justice Mill Lane at the back, the building stretches to 12 storeys. Letting agents are Ryden, Savills and A B Robb.